The first race in my 1 Million Metre challenge with Alex Flynn, went rather well. Weather for that day was ideal for running, slightly overcast, with a threat of rain, that arrived in the last 5 miles of the race. 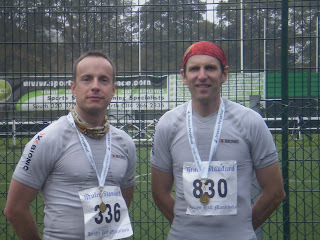 Both Alex and I were in X-Bionic gear, which despite the rather chilly start and damp, yet warm finish, played its part well and seemed to keep my body tempertaure nice and even thoughout the race. X-Socks on my feet also kept them dry and thankfully odour free. The pace of the race was dictated not only by a 2 mile long hill, of increasing gradient, but also by Alex due to a niggling knee problem, but with me constantly talking and pushing him, onwards we completed in just over our target time of 2 hours. The race was, as before, well organised, with plenty of support, and hopefully photos will be comng soon showing me resplendant in my new birght buff and X-Bionic gear. Next up for me is a quick (ish) 10k at Brentwood, as the half was sold out. Thankfully i have enough metres planned to allow for the odd change in plans, but i plan to use this race as a speed session, rather than just adding to the distance. After that in 8 weeks is the Doyen of the Downs, which starting at 8am in the beautiful town of Arundel, in the first weekend of December, will be decidedly colder, and will probably need longer leg wear, as well as compression socks (already supplied by X-Bionic). Alex will need to be prepared for hours of nagging to get him round (as instructed by him), but its a race i am looking forward to.